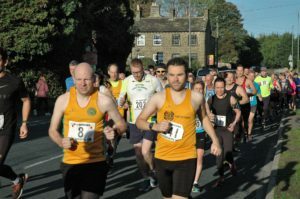 The Holmfirth 10k (and 15 miler) are organised by Holmfirth Harriers and is into its 50th year, first being run in 1968. The 15 mile road race consists of a small loop around the high school and two large loops around the New Mill, Honley and Holmfirth “circuit”, the 10k uses the same circuit but replaces the loop to Honley with a tough climb up above Smithy Place. The 50th running of the 10k saw 187 finishers, first home and the winner was Scott Hinchliffe from Penistone Footpath Runners finishing in 33:49. Marie Boland (unattached) was first female home in 42:11. Two Striders were among the finishers and their times are given below. Well done!